Aptech English Learning Academy uses authorized course material from the internationally-acclaimed Cambridge English Language Teaching (ELT). The Academy now offers courses designed by Middlesex University, London, to help students develop their skills in the English language. With centres across the world, Aptech English Learning Academy is looking to further expand its footprint in the near future. 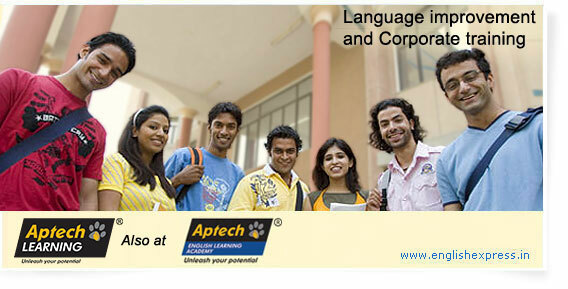 Wish to open an Aptech English Learning Academy centre in your city? Fill this form. Spoken English courses improve fluency & pronunciation in English through a variety of interactive classroom sessions. These courses are offered at 3 levels: Pre-intermediate, Intermediate and Upper-intermediate. This course is suitable for working professionals & job-seeking students. A grammar assessment test determines the participation in the course. The program trains individuals in the basics to the advanced levels of business communication. These preparation courses helps students be confident and ready to appear for IELTS and TOEFL. The esteemed English department of Middlesex University has designed the structure and content for the courses.